A trip to his local indoor kart track near Baltimore in early 2014 has led American Cameron Das to the Castrol Toyota Racing Series, which starts at Ruapuna Park, Christchurch, on January 12-14. Das showed some promise and won some local kart events that year. In 2015 he dipped his toe in the water of single seater racing in Formula F and Formula Lites competition with more success. 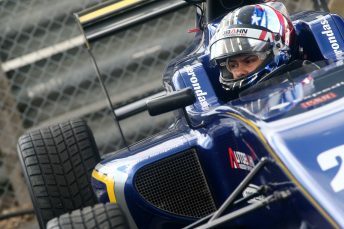 With support from his parents, he did the full season of the inaugural Formula 4 United States Championship, taking nine wins in the 15-race series. He also had fourteen fastest laps and started from pole position eleven times. That led to a full season in the United Kingdom this year where he finished fifth in the British Formula 3 Championship on tracks he had never seen before, scoring a win, seven podiums and four fastest laps. He also took four pole positions and set the new track record at Donnington Park. Das will use the same Tatuus single seater as every other driver in the series. It is powered by a 1.8 litre Toyota engine producing about 145 kWs running on an 85 per cent ethanol bio-fuel. All cars use the same Michelin tyres, gearbox, suspension and brakes to provide as close as racing as possible, with driving skill being the deciding factor.